You can already order our tulip bulbs, these will be delivered in October as soon as it is time to plant them. Due to different delivery times, dahlia tubers and tulip bulbs cannot be combined in 1 order. We grow all tulip bulbs ourselves and guarantee top quality. You will receive a large size bulb so you can expect beautiful bold flowers. We have various types of tulip bulbs for sale such as single and double tulips, multi-coloured and also fringed tulips. Tulip bulbs give a wonderful spring feeling to your garden. It is very easy to order tulip bulbs online from our Farm in Holland. We deliver these (within EU) by post in an attractive gift box, as soon as it is time to plant the tulip bulbs (as of October). 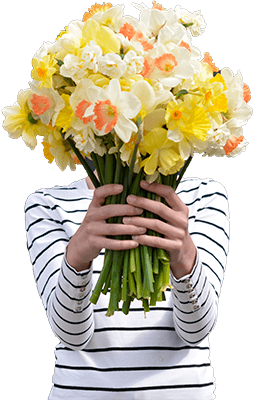 Our webshop with flower bulbs includes not only tulip bulbs, but also daffodil bulbs. These two together are the most popular spring flower bulbs. We e also sell Dahlia tubers that are increasingly popular summerflowers. Checkout the enormous range of varieties, sizes and colors at our dahlia webshop. The best time to plant tulip bulbs is in the autumn, from October to December. Tulip bulbs need a period of cold first before they start to bloom. All food is already inside the tulip bulb, so it can hardly go wrong. Plant tulip bulbs together in groups or divided into the border. Tulips also do very well in (well-drained) pots. In spring the tulips pop up and you can enjoy your flower garden. Plant a lot so you can cut off some flowers and also enjoy them in your home. - How to plant tulip bulbs? - Can I plant tulip bulbs in pots? - How do I enjoy flowers as long as possible? If you follow us on Instagram or Facebook you can follow the story about our tulip bulbs, our Flower Farm and the seasons. Enjoy the beautiful flower fields. We also give handy garden tips and we explain special varieties. On Pinterest you can easily view all the beautiful tulip pictures and pin them on your own board.